Minuteman Missile is something you should read. This presentation was prepared by Otto Bochman for the Western Dakota Tech / National Park Service Plus 50 Class Rapid City South Dakota. Minuteman Missile is "hidden in plain site" and tells a story of the Cold War. The missiles had the power to destroy civilization but it acted as a nuclear deterrent. The Minuteman Missile visitor center is located off Interstate 90, exit 131 east of Wall, South Dakota. The missile silo is located at exit 123. An eight ton door secures the entryway into the launch control center and was made of very thick steel and concrete. 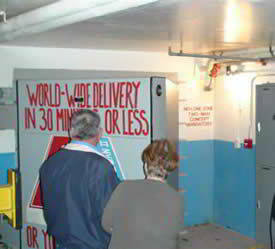 It was known as a blast door and was to protect the missile crew from the effects of nearby nuclear ground blast.